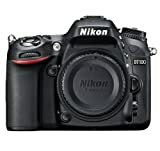 When it comes to digital SLR cameras, there are few brands which have a better reputation for high-quality photographic equipment than Nikon. 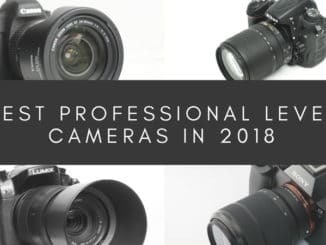 Having celebrated 100 years of being in business in 2017, they are never far away from the Top 5 lists of camera manufacturers whenever photography enthusiasts and professionals are asked. Nikon’s product range includes a lot more than just cameras. They produce camera accessories such as lenses, and other equipment where lenses play an integral part such as microscopes, binoculars, ophthalmic equipment, rifle scopes, and laser range finders, to name but a few. What we are going to be looking at in this article is two of Nikon’s best rated digital SLR cameras, namely the Nikon D7100 and the Nikon D7200, to discover which of these Nikon products is prime among their range. 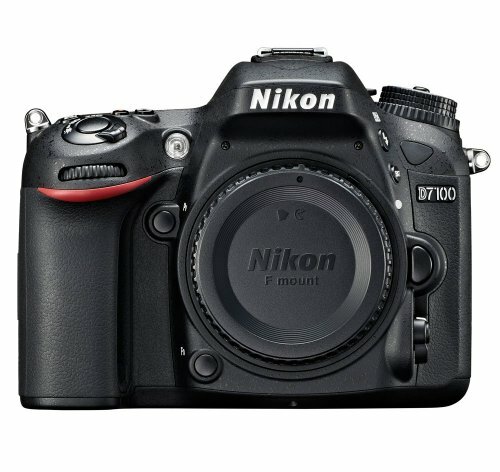 Even for top-rated products such as the Nikon D7100 there comes a time when a more up-to-date version comes along with new features, as is the case with the Nikon D7200. This does not mean that the D7100 loses its quality and appeal, as it is still a very popular digital SLR camera. One point to note is that, as these cameras are high-specification products from the same manufacturer, there are some technologies and components which are the same in both, so there is nothing to compare in that respect. However, so that you fully appreciate what these similarities are in terms of using the camera, we will briefly touch on the most important ones. 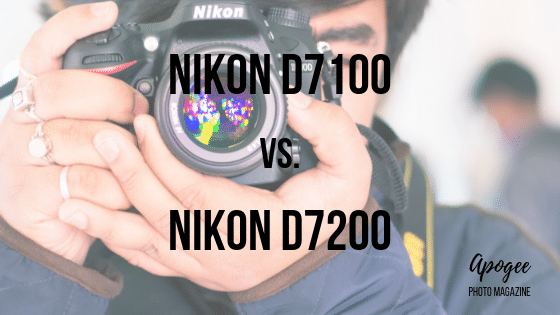 To make it as easy as possible to compare the Nikon D7200 and the Nikon D7100, we are going to select seven of the most important features that anyone considering buying one or the other camera would look at. We don’t know which of these features are going to be more significant to you than others, so the order in which we compare them is not ranked in order of importance. As we mentioned above, there are numerous features of both cameras which have the same configuration and high specification. On the mechanical side, they both have a built-in flash, a shoe for an external flash, ports for both headphones and a microphone, two extra slots for storage cards, and both cameras have environmental sealing so that they are useable in the toughest of outdoor conditions. For the specifications and features relating to taking photographs, they each have 3.2″ LCD screens, continuous shooting of 6 frames per second, time-lapse recording, maximum resolution of 24 megapixels, and if all that wasn’t enough, they both have RAW support for higher quality images, and face detection for clearer focus. 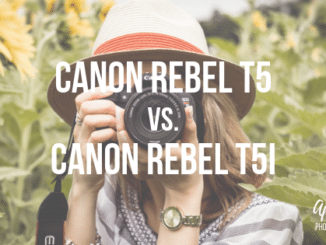 There are other similarities, but having just mentioned these main ones, we have hopefully shown you that either camera offers top specifications for photographers, whichever camera they are using. ISO is how photographers can brighten or darken the images they are taking. It is used in conjunction with shutter speeds and aperture settings to produce the best possible photograph. With no two locations having the same level of light, the ISO setting in a camera can allow photographers to take quality photographs when the light is diminished or lacking, or if adjusting the shutter speed or aperture cannot achieve this. The higher the ISO setting chosen, the darker conditions in which photographs can be taken, however, this can sometimes mean a grainier picture, so there is a balance to be found. However, on this score, the D7100 is well beaten by the D7200 which has its highest ISO setting of 25600 which is three times more capable of producing brighter photographs when lighting conditions are not ideal. Verdict: The ISO of the Nikon D7200 is top here. The color depth of a camera is the indicator of how many distinct color tones a camera can produce. It is particularly important where there are scenes that have subjects in them that are the same or similar color, but within that color, there are multiple levels of shade, tone, and intensity. Examples of these include photographs of the sky where the blueness can vary across your field of vision, or out in the countryside where there is lots of greenery but hundreds and even thousands of shades of green. Every scene will have this, even objects which appear to have a constant color across its surface will have variances due to different light sources hitting them or from shadows across them. Color depth is measured in ‘bits’ which means a camera with a color depth of 12 bits can produce 212 colors, which is 4,068 to save you reaching for your calculator. The D7100 has a rating of 13.7 which allows for an impressive 13,308 colors on any image it takes. The D7200 is at 14.6, which seems a minuscule variation of just 0.9 but you will be amazed to know that when we do the calculation, it gives us an incredible 24,833 which is almost double the color range. This gives the D7200 a huge advantage when it comes to its ability to produce a photograph with a much bigger spectrum of color. Verdict: Medal color is gold for the Nikon D7200 on this one. We have brought two elements into the one section as they are similar although they offer different advantages. In terms of wireless connectivity, this allows photographers to connect via Wi-Fi to the internet for several reasons, with the main one being the ability to upload their photographs instantly. 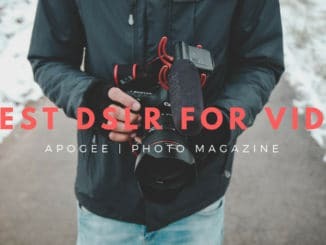 In today’s world of social media, and multimedia being a sizeable part of our daily lives, this would seem to be a feature that most photographers would want. In the case of the D7200, being able to connect wirelessly is a built-in feature, so there are no issues there. With the D7100, it is an optional extra, with the cost being dependent on your retailer’s pricing policy. In terms of remote control, this is not included in the D7100, but it is with the D7200. The remote control, or Near Field Communication (NFC), to give it a proper title, allows you to operate the camera remotely using your cellphone or wireless device. This will be extremely useful if you ever want to be in a photo but there’s nobody around to take the shot, or for taking photographs where it is not practical or even safe for you to hold the camera when taking pictures. Verdict: Nikon D7200 easily wins here. We’ve all experienced it with equipment which relies on batteries such as cellphones, laptops, and of course cameras. We are out and about without a charger, and the battery gives up. Not always a critical issue, but sod’s law states that it is bound to happen just as we eye up an amazing scene we want to shoot with our camera. Obviously, we can make sure we have a fully charged battery or even a spare battery with us, but the easiest solution is to have a camera with decent battery life. Both cameras do. The D7100 has a very respectable battery life which will allow you to take the equivalent of 950 pictures. This is enough to put it ahead of most similar cameras. However, it does not beat the D7200 which has a battery capacity of an extra 160 shots, taking it up to 1,110 frames. 160 shots might not seem like a lot, but it could be the difference between being able to take that stunning photograph when the opportunity arises or being frustrated that your camera has temporarily expired. Verdict: Both have great battery life, but the Nikon D7200 edges this one. The simplest explanation of dynamic range when it comes to photography is that it’s the difference between the lightest parts of your photograph and the darkest. Some people refer to it as the contrast between the pure black and the pure white colors of an image. In practical terms when it comes to a camera’s dynamic range, it is measured in terms of stops, which correlates with the human eye’s ability to perceive the difference in light and dark tones. The human eye, if it were measured as we do a camera, would have about 20 stops of dynamic range. Why is this important? It’s important because the higher a camera’s dynamic range is, the clearer and sharper the photographs taken with it will be, in both the brightest and darkest area of the scene. An example would be when part of the scene is in shadow, and part is bright sunlight. Thankfully, both the D7100, and the D7200 have excellent dynamic ranges, but once again the D7200 comes out on top. Its dynamic range is 14.6 whereas the D7100 is 13.7. You might be saying, ‘Well that’s only 0.9 of a difference,’ and you’d be right. But that 0.9 is enough to be the difference between a photograph where very light and very dark areas are clear and one where they are not. Verdict: The Nikon D7200's 0.9 higher dynamic range wins. When you are considering the merits of the focusing features of a camera, you will likely be checking out its ability to autofocus, and this is strongly influenced by the camera’s EV or exposure value capabilities. EV is a figure which is arrived at using a calculation that includes the f-number (focal stop) and the shutter speed. Both these number can be varied using the control on the camera, so you will find that the same EV number applies to lots of different combinations of both f-stop and shutter speed. In respect of auto-focus, the higher the range of EV levels then the more ability the camera has to adjust when auto-focusing especially in conditions where more exposure is required. With the D7100 the EV settings go to -2EV which allows it to take excellent photographs in dark or poorly lit scenes. The equivalent rating on the D7200 is -3V which means when it autofocuses it can more ably adjust itself to take account of even worse light conditions than the D7100 can. Verdict: The Nikon D7200 is focusing in on victory. Thought we’d quickly mention the weight difference as this can sometimes be significant to both professional and amateur photographers who may need to move around a lot or who cannot physically carry lots of heavy equipment. Making savings on the weight they carry on each piece of equipment can be the difference between enjoying the photography experience or looking at it as a Herculean effort. The variation is not huge with the D71000 weighing in at just under 27 ounces and the D7200 slightly lighter at just under 24 ounces. If you were to hold one in each hand, you might feel a slight difference, so this may not seem definitive one way or another. However, 3 ounces is the equivalent weight of one apple and if every piece of equipment you carried weighed 3 ounces more than its alternative you would soon notice it. For those for whom equipment weight is a major factor when deciding which to purchase, this small difference could play a large part in their decision. Verdict: Nikon D7200 wins again. Unlike many products, cameras have a multitude of different features and specifications that all contribute to the results they will produce and ultimately the enjoyment its owner gets from using it. There is no doubt both the Nikon D7100 and the Nikon D7200 are high-quality cameras with specifications which many competing cameras simply cannot match. While that comparison is valid, the whole of this review is to determine which of the two cameras takes the top spot. Although with many features, the differences were relatively small, such as the weight and battery life, there are other differences which are significant, especially those relating to the quality of the photographs taken. Greater specifications for ISO values, dynamic range color depth, and EV for the D7200 against those for the D7100 all give the D7200 a big advantage. The Nikon D7200 gives photographers at all levels the opportunity to capture images of clarity, sharpness, and color, which the 7100, unfortunately, cannot match. 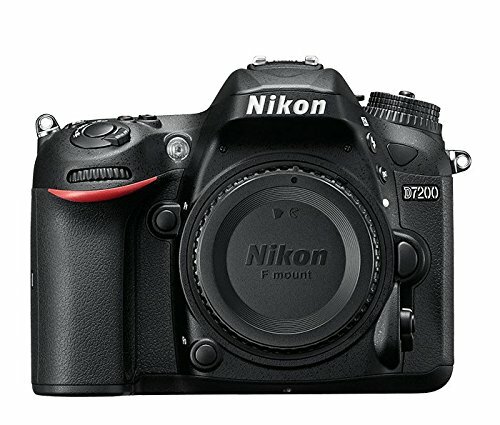 Therefore, the Nikon D7200 comes out on top of our review.